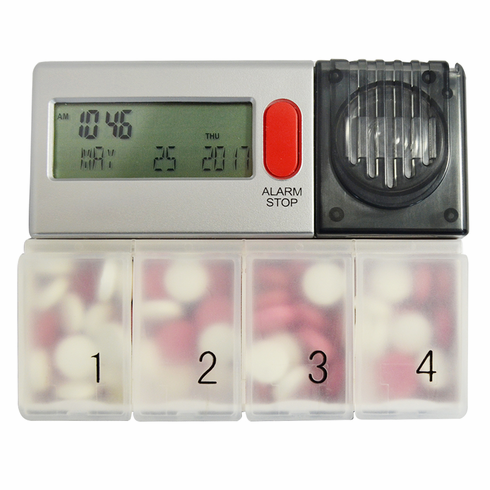 The e-pill Timex Medication Manager is a combination Daily Pill Timer and Pill Box. 6 Daily Pill Alarms Automatically Reset every day. The pillbox slides on and off easily to allow for fast filling. Easy-to-use pill dispenser with alarm clock and talking reminder (example: "Take PillBox Three"). Never miss a pill again. Once you set the Timex medication manager it repeats every day. Note: Alarm signal is NOT loud. 3 short bursts of alarm, repeats once every minute for three minutes.